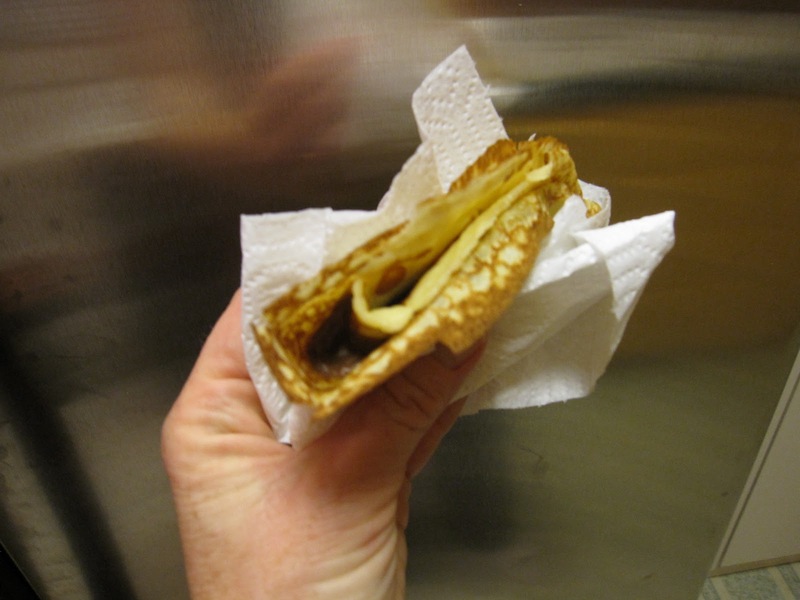 The History Quilter: Crepes, anyone? The pull of travelling to Europe has been especially strong in the last few weeks and with anything it permeates my choice of what to make for me and my people. Am I going to Europe anytime soon? NO. The combination of ever-getting-higher airline prices and children aging out of child fares = no three week trip to Europe this summer. Bummer. I can't help but like airline food. 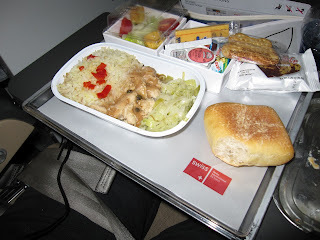 I know it's gross, made somewhere else and usually not very flavorful, but airline food is still part of the whole experience of travelling. Planning, packing and getting to your destination are ALL enjoyable to me. I love food stands. This one is in Prague, Czech Republic and yes that is me. 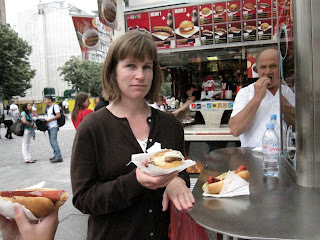 This was a sausage stand with about twenty different kinds of hot dogs/sausages. So many choices makes everyone in the family happy. Gelato. Nectar of the Gods in my book. Never have it here (I'm a snob) but eat it at least twice a day while in Italy. 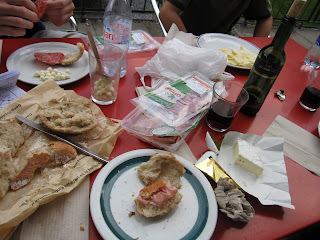 Our lunch or dinner of choice in Europe: Salami, cheeses, fresh bread and wine. Easy to procure and yes, the husband is a tightwad when it comes to parting with his hard earned $$$. So on to Crepes. One reason for taking a lot of food pictures while on vacation, is to help me replicate those items at home (NOT the airline food!). 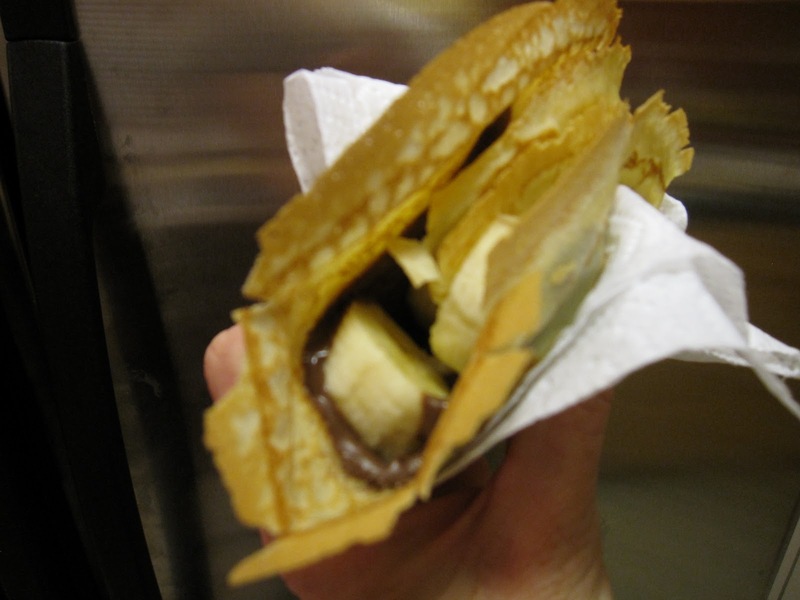 I first discovered crepes in Paris, France in 1986 while on an Easter Break study trip in my Junior year of high school. Loved them but didn't catch the bug until the husband and I went to Spain and France in 1995 - came home and bought a Caphalon Crepe pan and have been making crepes ever since. Combine all ingredients in a blender and let rest for an hour. When you are ready to make the crepes, give the batter another whirl in the blender. Heat up your pan (med high) and spread a small amount of unsalted butter around. When butter is melted, pour about 1/4 scant cup of batter in your pan and then pick up pan to swirl batter around. It's like a pancake - you are not looking for bubbles, but the sides will show when it is ready to turn. Turn over with a large spatula (or flip if you are really cool. I'm not cool.) and cook for a very short time. Your crepe is now done and ready to be embellished with anything you like. Nutella, bananas, butter/powdered sugar, any kind of jelly/jam - the sky is limitless. My husband has been promising to make me crepes for months! I'll have to print this out and convince him to finally make them. 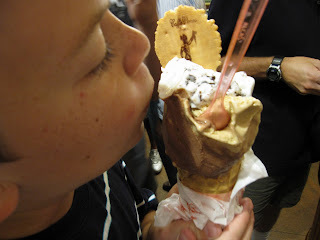 :) The gelato made me laugh - 15 years ago when I went to Italy with my family, my mom and I ate gelato at least once a day too! Usually for lunch. We love crepes too! I put yogurt and fresh fruit inside. So cool that you have been able to travel extensively! Great picture of you, BTW! YUM. Can't say I have ever made crepes...but that banana/nutella one sure made me drool. If I hadn't already finished cupcakes for my husband's birthday, these would have been in my kitchen last night. hi susan, I live in Trieste which is a small (not so small) town north east of Italy on the slovenian border...(one hour by car north of venice)..ever been? I lied ...i also eat crepes "salted" with mushrooms (or other vegetables) and besciamella sauce..or cheese, grilled in the oven ....ever tried?